Foreign Currency Exchange Pricing - What is the Interbank Rate? The foreign exchange market is a global decentralised market also known as an over-the-counter market where bank dealers make the market to determine the interbank exchange rate. For example, the rate the banks use when trading with one another. Unfortunately for most of us, this rate is reserved solely for banks and large financial institutions trading in large amounts of foreign currency. For retail or business banking customers looking to make smaller international money transfers, a margin (or spread) will be applied to the interbank rate to ensure a profit for the service making the transfer. As a retail banking customer, this margin may be anywhere between ~4-5% of the interbank rate.The graph below illustrates the rate that a customer may expect to receive from the bank when converting their own currency, such as AUD or NZD to GBP. Naturally, when sending money abroad, it’s in your best interests to ensure you keep as much of your money as possible by locking in a favourable rate of exchange. 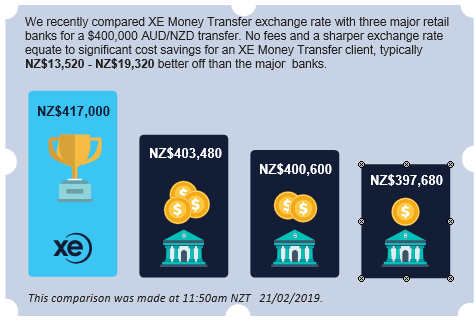 However, one of the most sure-fire-ways to ensure you are receiving a competitive rate is to look at using an international money transfer services provider like XE who provides a much sharper rate of exchange than you would otherwise receive from the banks. XE works closely with our broad network of referring partners to provide their clients with a competitive, secure money transfer solution. As such, when you choose XE Money Transfer via one of our partners, you will receive preferential rates of exchange that are more competitive than you would receive from other providers. At XE, we pride ourselves on delivering our clients value beyond a great rate. We provide a more comprehensive service than they could expect to receive from the banks. Exchange rates fluctuate at any given minute and as such our expert team are on hand to be your eyes and ears on the market and advise on how to ensure you lock in the best rate possible. XE also offers a range of products typically not made available to retail banking clients,including Market Orders and Forward Contracts, that will help you reduce your exposure to currency risk.